Belladonna - White Buffalo Trading Co. Enough yummy berries to kill. Note: This entire page is Copyright by Datura Don, White Buffalo Trading Company. All Rights Reserved. © 2011-2019. 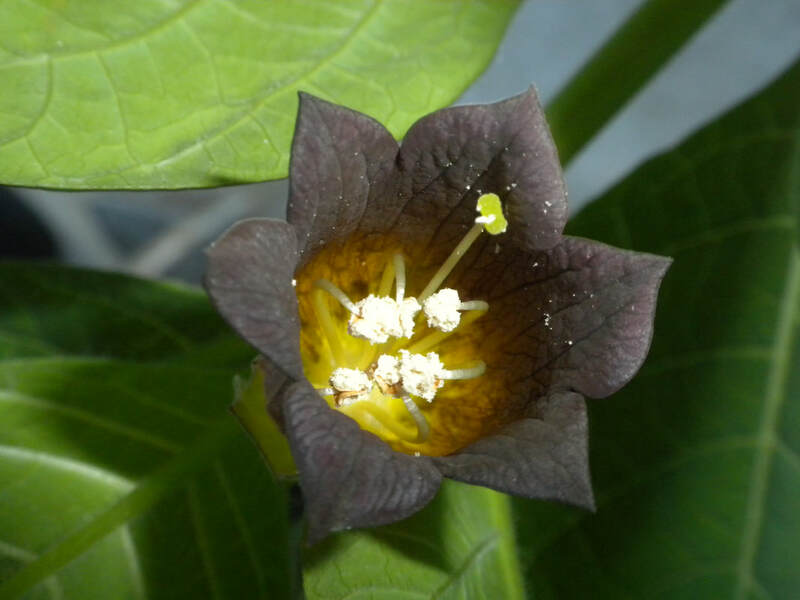 Deadly Nightshade, or Atropa belladonna, has been used for over two millennia as a medicine, cosmetic, poison and witch’s herb. Contains psychotropic alkaloids, including atropine. This plant is a medicine, hallucinogen and poison. Deaths usually occur by eating lots of the ripe black berries, which taste dangerously delicious (I have eaten them myself). AKA: Dwaleberry, Dwale, Dwayberry, Devil’s Herb, Murderer’s Berry, Witch’s Berry, Black Cherry, Belladone, Belle-Dame, Belle-Galante, Bouton Noir, Cerise du Diable, Cerise Enragée, Cerise d’Espagne, Divale, Grande Morelle, Indian Belladonna, Great Morel, Guigne de la Côte, Herbe à la Mort, Herbe du Diable, Morelle Furieuse, Suchi, Naughty Man’s Cherries, Sorcerer’s Cherry, Poison Black Cherries. Belladonna has a history for over two millennia of use as a medicine, cosmetic, poison and witch’s herb. Native to Europe, it belongs to the Nightshade family which includes all tomatoes, potatoes, eggplants, wolfberry, Datura, peppers and tobacco. When Duncan I was King of Scotland, Macbeth gave liquor spiked with belladonna to an army of Danes during a truce, assuring his victory over them. The ancient Greek mystics would drink an infusion of belladonna when they visited the Oracle of the Delphi, and added the juice to their wine of the Bacchanals. May have poisoned the Roman Army under Marcus Antonius during the Parthian War. Eye drops used by women throughout history as a cosmetic for pupil dilation. Used in many modern medicines and by eye doctors. Primarily leaves, also root, ripe black berries. Homeopathy, neuralgia, gout, rheumatism, renal and biliary colic, asthma, sciatica, colitis, diarrhea, diverticulitis, nausea, Irritable Bowel Syndrome (IBS), stomach upsets, excessive stomach acid, fever, headaches, migraines, scarlet fever, sore throat, whooping cough, vomiting, flu, common cold, coughs, nerve pain, menstrual cramps, arthritis, constipation, stress, inflammation of the brain or spinal cord, peptic ulcers, boils and abscesses, depression, excessive sweating, motion sickness, incontinence, muscle pains and spasms, bed wetting, Parkinson’s disease, restlessness, anxiety, insomnia, and sensitivity to light, touch or noise. Dries up unwanted mother’s milk. Antidote for chloroform, opium, mushroom and parathion poisoning. Relieves the discomfort and swelling of the skin associated with breast cancer radiotherapy. Anodyne, anesthetic, anti-spasmodic, calmative, relaxant, anti-cholinergic, narcotic, diuretic, sedative, and mydriatic. This plant has a powerful effect on the heart, lungs, brain, and nervous system. Used by witches for literal out of body Soul travel. Atropine, hyoscine, scopolamine, apoatropine, torpine, pseudotropine, hyoscyamine (root), flavone glycosides, coumarins scopoline and scopoletine, tannin, phytosterol. Tropeine alkaloids including hyoscyamine, scopolamine and atropine. As anti-cholinergic deliriants, they block muscarinic receptors, which in turn excite dopaminergic neurons. They are readily absorbed, partially metabolized by the liver, but mostly eliminated in urine. The peripheral receptors are on the exocrine glands which affect sweating, salivation, and cardiac muscles. Dilation of pupils, hallucinations, and delirium. A belladonna “dosage” starts with pleasant hypnotic and visionary effects including out of body flying. These effects degenerate later into blurred vision with light-sensitivity, dry mouth, memory loss and incoherent babbling. Drink tea, eat ripe berries, smoke dried leaves, ointment, homeopathic dilutions, tinctures. Headache, urinary detention, flushed skin, rash, dry throat, nausea, fever, loss of balance, loss of voice, eye damage, brain damage, convulsions, asphyxiation, heart attack, death. Deaths to children have been documented from ingesting the tasty black berries. It has been reported that only five ripe belladonna berries can kill a child, 10 to 30 berries could kill an adult. Root is most toxic. Leaf, root and berry juices can be absorbed through the skin, so be careful if handling them. I have personally eaten a berry and noticed no effect whatsoever. But a slice of belladonna berry pie would kill you, and taste delicious. Atropine disrupts the parasympathetic nervous system’s ability to regulate vital non-volitional and subconscious activities such as sweating, breathing and heart rate. Herbalists should keep the plant in a fenced or locked back yard and warn children of its danger. IF taken internally, Induce vomiting: immediately drink an emetic, such as a large glass of warm water mixed with vinegar or mustard or salt. Administer a colonic irrigation or coffee enema. Administer antidotes listed above; keep patient hydrated and monitor body temperature. Administer CPR if breathing stops. Belladonna is a perennial, seed-bearing branching herb growing to 5 feet tall, with 8-inch long ovate leaves and a purplish stem. The whole plant is of a light green color, except the flowers which are large and of a brownish purple, and the berries which are of the rich deep black of black cherries or black widow spiders. The root is thick fleshy and much branched the stem grows about two feet high and the leaves are oblong tapering to each end. The flowers are bell shaped larger than those of the harebell and placed singly in the bosom of the leaves. The flowers are bell-shaped, blue-purple or dull red, replaced by a black or dark purple half-inch berry. The border of the corolla is cut into five equal lobes and there are five stamens and a tapering pistil with two cells. The leaves in first-year plants are larger than those of older plants. The foliage is sensitive to cold and is a dark green color with pronounced veins on the undersides of the leaves. From the Roman era through the Renaissance, Venetian woman commonly used belladonna to dilate their pupils in order to appear more attractive and sexually appealing to potential suitors or clients. For many centuries, Egyptian and Babylonian did the same. The name belladonna literally means “beautiful woman.” The name is also believed to have derived from an admonition in Italian and Greek meaning “do not betray a beautiful lady.” Its common name derives from its use in eye drops by women. The generic name of the plant, Atropa, is derived from the Greek word Atropos, she of the Three Fates whose job was to cut the thread of life (a reference to the plant’s poisonous nature). It is also linked to the active alkaloid in the plant, Atropine. According to The History of Scotland, the soldiers of Macbeth poisoned an entire army of Danes under the Scottish King Duncan I. They brewed an alcoholic drink that was infused with belladonna and then supplied it to the invading army. It was the plant that was used in “Romeo and Juliet” to put Juliet to sleep. During the time of Pliny, belladonna was used as an anesthetic for surgical procedures. During Chaucer’s time in England, belladonna was known as dwale. The first recorded use of this plant was for cosmetic purposes rather than medicinal. In 1753, Linnaeus gave the first known botanical description of belladonna in his Species Plantarum. Belladonna is used topically and internally for a variety of purposes in both folk and modern medicine due to its pain relieving and anti-spasmodic qualities, as well as its ability to dilate pupils. Some over-the-counter cold remedies use belladonna extract to clear mucous from nasal passages. Atropine is commonly used in optometry to dilate pupils for eye exams and to prevent spasms. It was once used in cosmetics as well to dilate pupils. Throughout the witch trials of the 16th and 17th centuries, where hundreds of thousands were put to death in Europe and America (usually by hanging in actuality, in lore by burning at the stake, but I recalled in shamanic therapy being buried alive in that incarnation), trial documents consistently speak of a witch’s secret Flying ointment. Old recipes still exist, and they tell how flying ointment was made from a blend of several herbal ingredients, each of which produced a particular physiological effect. Belladonna was mixed with aconite, mandrake, henbane and even opium poppy, among other herbs, producing a potent mix that would take users out of their bodies. Belladonna and its Solanaceae cousins in the Solanum genus (the common nightshades) all grow wild throughout Europe, Asia and the Americas. A hardy perennial, it is a standard feature in any witch’s garden, preferring sun and alkaline soil. Native Origin: Europe, North Africa, and Western Asia, naturalized to the Americas. Favorite Habitat: Sunny woodland or river bank, low altitude, Mediterranean climate, well-drained, alkaline soil. Soil Requirements: Moist, alkaline, well-drained (add lime and sand). Soil pH: Alkaline. Prefers 7.5 (mildly alkaline) to over 9.1 (very alkaline). Sun: Prefers full sun, but not heat. Tolerates half shade. Water: Keep moist. Too little water will result in dead branches. Fertilization: Fertilize weekly once established and flowering. Planting Time: All four seasons. Hardiness: Frost hardy. Grows back in Spring in harsh winter climates. Seed Germination time: Three days to eight weeks. Intermittent germinator. Seed Germination Methods: Direct sow, heated flats. Seed Pollination: Insects: beetles, moths, bees. Plant Propagation Methods: Seed, cuttings, root ball split. Bloom time: Mid summer to late fall. Pests: Snails; aphids; white flies. USDA Temperature Zones: 7 to 10. Gather berries as they ripen, harvest, and dry. Gather leaves when plant has finished flowering and berries are ripening. Harvest leaves from plants that are two to four years old. Dry, sunny conditions produce more alkaloids. Belladonna grows from a thick branching root to a height of 50-150cm. The stem is bluntly angular and branches freely. The large pointed oval leaves grow in pairs; they are dark green ion the upper surface and a paler green on the underside. Single bell-shaped flowers, with crowns about 2cm in length, grow in the leaf axils; their color is a brownish-purple. In late summer, shiny black berries develop. Belladonna is hardy throughout much of North America and Europe, dying back in cold winters and rising from the root ball in spring. It prefers a well-drained, well-limed soil in full sun or part shade. The soil should be kept moist at all times. Plants exposed to too much hot sun will be stunted. In hot sunny areas it may be grown between rows of beans or corn to shade it from hot afternoon sun. Seeds germinate slowly and irregularly due to germination inhibitors in the seeds that are designed to make sure that all the seeds do not germinate at once, just in case unfavorable conditions arise after sprouting. Seeds should be cold stratified for four weeks in the refrigerator before planting. Provide good moisture during germination, burying the seed just under the surface of the soil. Keep the soil warm throughout germination, about 75-80 F.
Belladonna is most frequently propagated by seed, sown in flats in early March. Because the seeds take 4-8 weeks to germinate, they should be started early and timed about two months before the last frost in your area. When the seedlings are an inch or so high they may be set out 18 inches apart. The seedlings should be well watered just after transplanting, and shaded for several days. First-year plants will grow only 1.5 feet high. The plants should be thinned to 2.5 to 3 feet apart at the approach of winter, or overcrowding will occur the second year. Belladonna may also be propagated by cuttings of the green branch tips. Plant in a location that has good drainage and long hours of sunlight. Add sand to the planting area and prepare at least a foot deep. Plant the seeds and tap into the ground or cover with a fine layer of sand. Water the location when the soils starts to dry out. Don’t let it dry out completely. It can almost take up to two months for the seedlings to emerge from the soil. 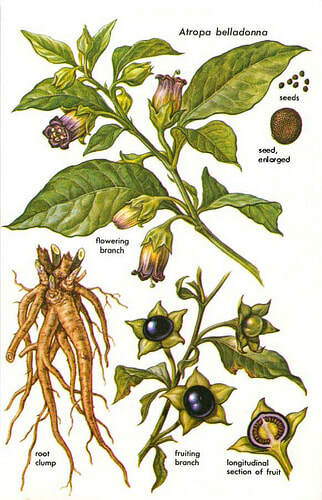 Belladonna will flower from June through early December, when some of the leaves and tops may be collected. In June of the second year the plants may be cut to one inch above the ground when they are in flower. In good years a second crop will be ready for harvesting in September. The roots may be harvested in the autumn of the fourth year, and new plants set in their places. The parts harvested should be dried quickly in the sun. Wilted or discolored leaves may be discarded, as they contain only small amounts of alkaloids. Traditional Uses Medicine. Poison. Used as a visionary or ritual herb. Main ingredient in the traditional and effective witch’s Flying Formula. The witch would travel out of the physical body. Locally applied, it reduces irritability and pain, and is used as a lotion, plaster or liniment in cases of neuralgia, gout, rheumatism, arthritis, muscle pain and sciatica. Useful for a wide variety of intestinal disorders. Alleviates fevers, migraines and headaches; traditionally used for whooping cough, Parkinson’s disease and Scarlet fever. Belladonna’s drying effect is useful for halting unwanted mother’s milk, incontinence and excessive night time urination. Calms the nervous system and its related conditions. A combination of belladonna alkaloids and Phenobarbital is currently a prescription medicine taken to relieve cramping and spasms of the intestines during an IBS attack. Noted as antidote for chloroform, opium, Amanita mushroom and parathion poisoning. Results of a clinical trial performed at the National Cancer Institute of Milan documented that homeopathic belladonna remedies are useful in relieving the discomfort and swelling of the skin after breast cancer radiotherapy. Belladonna has hallucinogenic qualities. Basically, small amounts of belladonna are medicinal, medium amounts are psychotropic, and large amounts are fatal. Without a chemical analysis of the exact amount of atropine in a particular specimen, homemade concoctions can vary considerably in alkaloid content and potency, rendering them dangerously experimental. 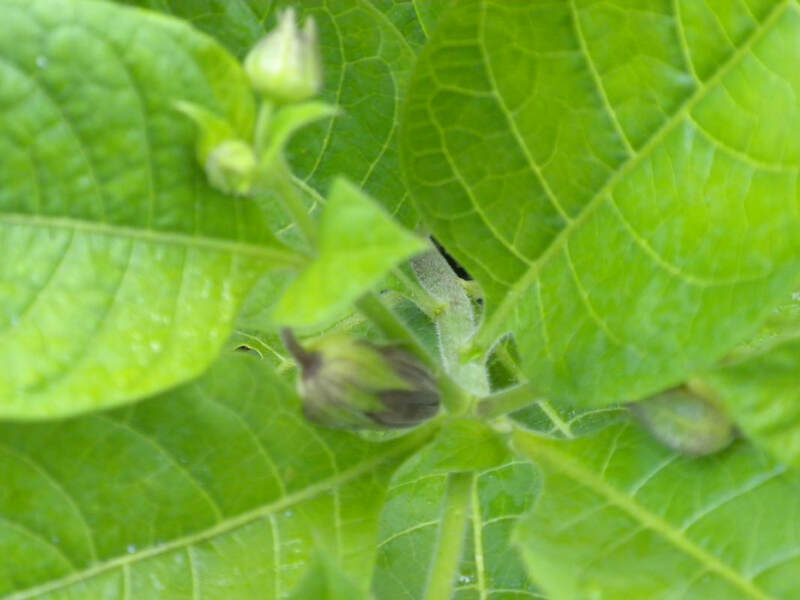 If you use belladonna for its psychoactive effects, smoking the leaves in a bong or pipe is the safest and mildest way to try the plant for the first time. Since the psychotropic effects are not immediate, stagger your intake over time. Homeopathy, medications for IBS including one with Phenobarbital and alkaloids of belladonna together. Medically, it is found in some sleeping pills to sedate, in cold medications to dry mucous membrane, in some asthma drugs where it is very effective, for dilating pupils in Optometry, is an antidote for opium poisoning, and is used in surgery as a muscle relaxant before an anesthetic is given. Poisonous! Small amounts can be fatal, or cause eye and brain damage! 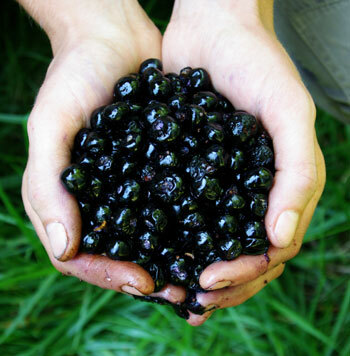 Belladonna berries are very shiny and tasty and therefore attractive to children who may confuse them with blueberries. One handful of berries could be fatal to a small child. The plant should never be situated where children have access to the ripe berries, preferably behind a locked gate. The author (DD) ate one with no ill effect and enjoyed the flavor, a personal testament to its allure. Warning: Never consume belladonna if you have glaucoma! 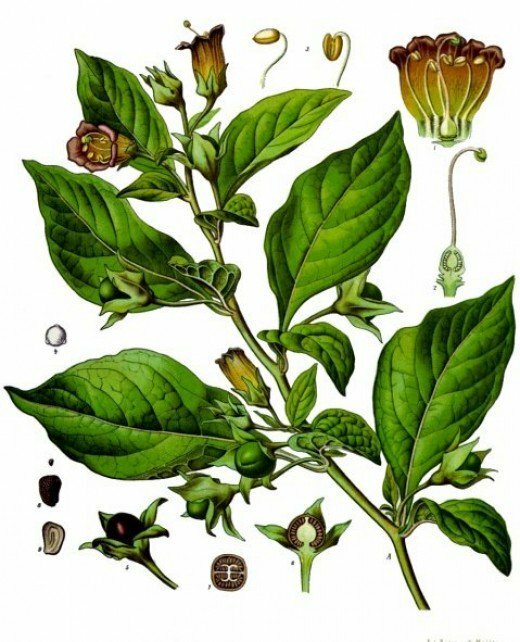 When used in native areas, the individual belladonna dosages range from 30-120mg for the root and from 30-200mg for the crushed and dried leaves, though it must be stressed that the upper ranges are not to be regarded as safe! The plant may be consumed orally or smoked. Warning: Human error or random high atropine content can make home remedies fatal! To make a belladonna infusion, add just one teaspoon of chopped leaf to one pint of water and steep in boiling water for five minutes. Let cool and refrigerate. Consume one teaspoon of the infusion twice a day. If no ill effects are noted, the dosage may be doubled. Too much can be fatal. To make a belladonna paste, soak the plant leaves in isopropyl alcohol, vodka or water for two days and then evaporate the liquid with gentle heat. The concoction evaporates into a gummy resin, which is eaten in minute doses. Dosage is only one fifth of a gram (0.2 grams). Too much can be fatal. Ancient Flying Formulas included aconitum, belladonna, calamus root, Potentilla simplex, Artemisia absinthium, mandrake, poison hemlock (Conium maculatum), hellebore and henbane. Other intoxicants in the formulas include Datura, hashish (Cannabis indica) and/or opium poppy juice (Papaver somniferum). The herbs are added to the separated and cooked fat of a freshly killed duck, and made into a salve or ointment. A. belladonna: Shiny black berries, purple flowers. S. carolinense: Small orange berries. S. citrullifolium: Fruit is enclosed in a prickly shell. S. dulcamera: Red berries, purple flowers. Perennial climber. S. nigrum: Black berries, white flowers. Small bushy plant growing 1-2 feet tall. This entire page is Copyright by Datura Don, White Buffalo Trading Company. All Rights Reserved. © 2011-2019.